Published on Thursday, May 13, 2010. This article appears in the June/July 2010 issue of American Craft Magazine. Dominic Di Mare Domus No. 1/Flaming Waters, 1982, wood, handmade felt, feathers, bone, silk thread, gold. Photo Schopplein Studio. "My work has always been of a personal autobiographical nature and has quietly evolved into a quasi-diary form." At the heart of the sixth floor of 72 Spring Street in New York City is the American Craft Council library, one of the largest collections in this country of craft, art and design books documenting the studio craft movement from the 1940s to the present. The over 14,000 volumes include the Council's 68-year publishing history-all past issues of Craft Horizons and American Craft. We'd like to share some of this amazing past with you each issue as we dig through the stacks. And if you happen to be in New York, the library is open to the public by appointment. 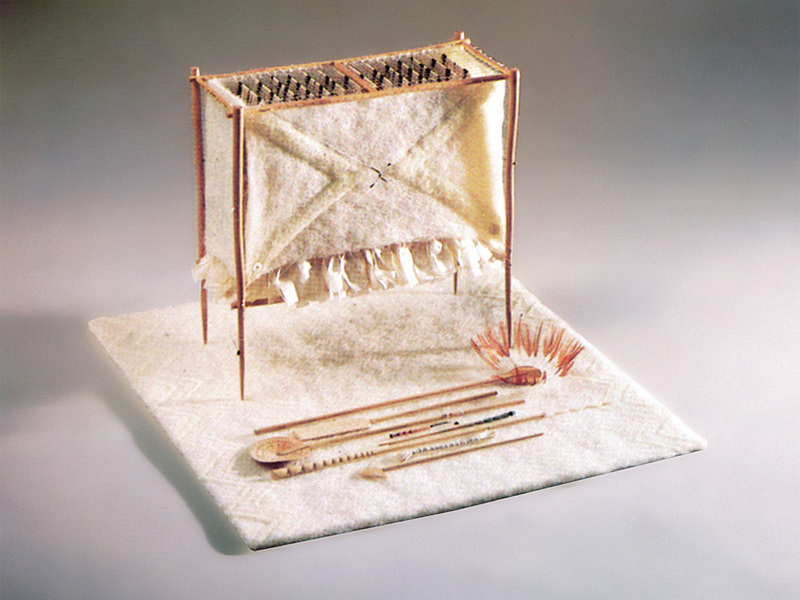 "Using a carefully chosen vocabulary of skeletal materials (wood, bone) and fibrous ones (paper, felt, thread), [Dominic] Di Mare builds structures for ceremonious attention to deeply felt experiences," wrote art critic Betty Park in her lyrical profile of the Bay Area artist in the October/November 1982 issue of American Craft. These shrine-like forms, holding memories of the artist's childhood experiences helping his fisherman father with lines and lures, are considered Di Mare's signature works, and they were honored in a touring retrospective curated by Signe Mayfield, which premiered at the Palo Alto Art Center in 1997. But he has also pursued other directions, such as a series of watercolor self-portraits and one-of-a-kind books in watercolor and ink scored with precise cutouts. "Di Mare is not an artist who stands still to one kind of medium," says Mayfield, who finds his books "incomparable, with sequential narratives of changing forms that are taunting windows to successive pages." Elected a Fellow of the American Craft Council in 1987 and a recipient of the Council's Gold Medal in 1999, Di Mare is represented in many museum collections, including, most recently, that of the Metropolitan Museum of Art. Although Di Mare is recognized as a pioneer of American studio craft, as Park observed in 1982, "his work eludes attempts to encompass it within any movement." "My work has always been of a personal autobiographical nature and has quietly evolved into a quasi-diary form," says Di Mare, "so exhibiting has not been foremost in my mind. I continue to work every day in my studio, still with a strong connection to a work ethic that has served me well for the last 40 years." Nevertheless, visitors to the Palo Alto Art Center June 20-Sept. 4 have the opportunity to view another imagining by Di Mare-enigmatic watercolor cutouts in an exquisitely constructed five-panel box. 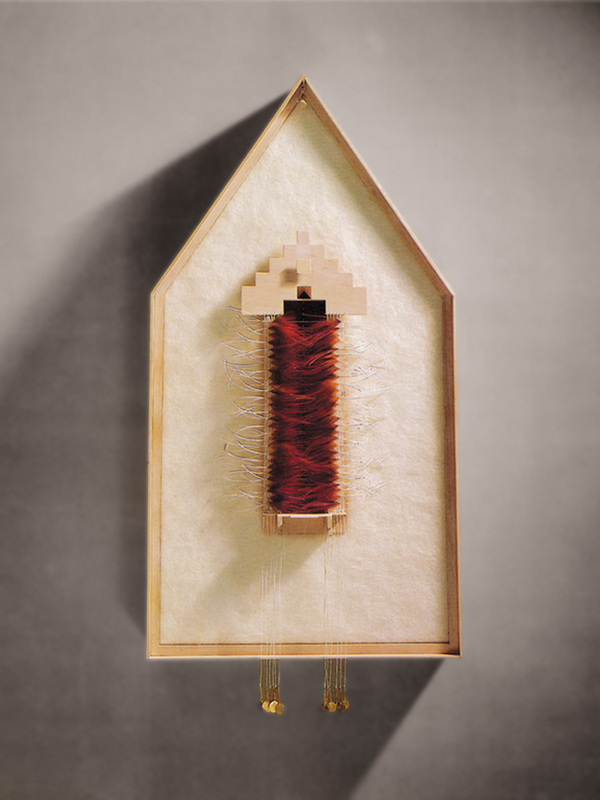 Dominic Di Mare Rune Bundle/D Series/Mare Dolore, 1981, handmade felt, hawthorn wood, bone, ivory, feathers, silk thread, brass beads, paint, watercolor. Photo Schopplein Studio. In the April 1973 Craft Horizons, Allan Peterson wrote about Albert Paley's outsized jewelry, the focus of his early career. Christine Kaminsky documents the Rochester artist's subsequent achievements in monumental sculptural and architectural metalwork and the recognition it has brought him over more than three decades. Eminent enamelist June Schwarcz is dubbed a Living Treasure of California.